COUNTESS: Will your answer serve fit to all questions? nay, as the pudding to his skin. For the past 10 years, I've spent the early hours of May Day at one windy waterside park or another, playing fiddle while my Morris-dancing friends dance up the sun. How the sun manages to rise unassisted the other 364 days of the year is a question for another day. On this day, Morris sides around the world do their part to assist the sun on its path. Nineteen hours before Seattle's dancers are due at Gasworks Park, dancers in Auckland, New Zealand, get the day started. Dressed in whites, ribbons and bells, they meet at the top of Mt. Eden to raise the sun. As it's now autumn in the southern hemisphere, dawn comes at around 7:00 a.m. in Auckland. Lucky Kiwis! 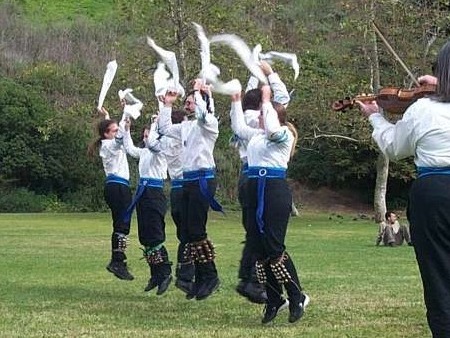 Morris sides exist primarily in countries with large populations of English descent or large British expatriate communities. After New Zealand, teams in Australia, Hong Kong and South Africa help to send the sun on its way west. England's many Morris teams pass the sun on to the Americans - both US and Canadian. By the time the sun makes it to the west coast of North America, it's almost done for the day. Still, to ensure that the sun keeps going across the Pacific and back to New Zealand again (after which it's on its own again until next year), Morris sides from southern California to Vancouver, BC participate in sun-raising. I noted last May Day that, "in Seattle, 'dancing up the sun' is usually a conceptual exercise...It's dark, cold, windy, and often drizzling, if not outright raining... The first team that has a full complement of dancers starts the dancing a few minutes before what we know intellectually to be dawn, and we dance until the sky has lightened enough that we can believe that the sun is, in fact, above the horizon." Like last year, however, this May Day morning was glorious. A bright half moon was high in the mostly clear, already lightening sky as Paul and I drove to Gasworks Park. Arriving at 5:30 a.m., we discovered that we were the first of the Morris folk there. (A few of the pagans who always come out for May Day dawn had arrived; they care much more about being out right at sunrise than do most dancers.) The dancers reached critical mass in time to do one dance before sunrise on the clock. The Cascade mountains and the I-5 bridge hid the sun for an additional ten minutes, so we saw "sunrise" at a few minutes after 6:00 a.m. After an hour and a half of dancing, the sun was well up in the sky. Our work was done, and we were off to Mae's for breakfast... and lots of coffee.